After all, it was only around 100 years ago that farming in the US transitioned from animal power to combustion engines. Over the past 20 years the global positioning system (GPS), electronic sensors and other new tools have moved farming even further into a technological wonderland. The cab of a contemporary tractor is a lot more complicated than it would have been even 20 years ago. 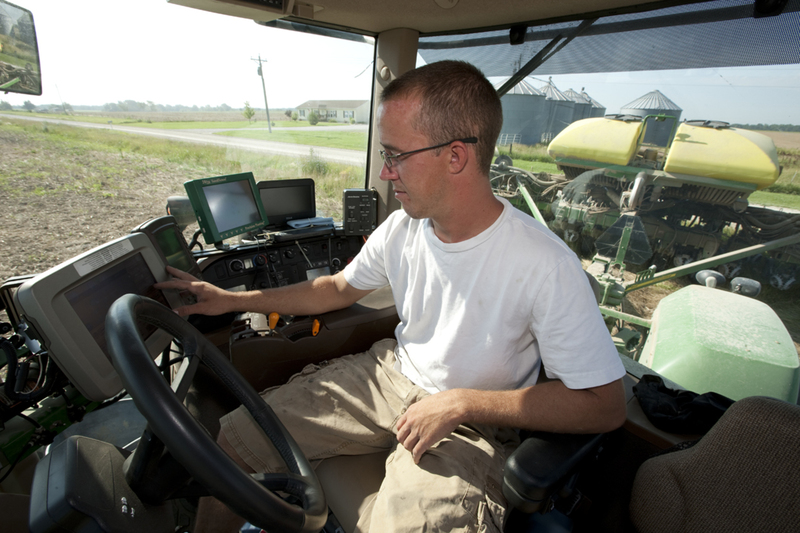 Beyond the now de rigeur air conditioning and stereo system, a modern large tractor’s enclosed cabin includes computer displays indicating machine performance, field position and operating characteristics of attached machinery like seed planters. And as amazing as today’s technologies are, they’re just the beginning. Self-driving machinery and flying robots able to automatically survey and treat crops will become commonplace on farms that practice what’s come to be called precision agriculture. The ultimate purpose of all this high-tech gadgetry is optimization, from both an economic and an environmental standpoint. We only want to apply the optimal amount of any input (water, fertilizer, pesticide, fuel, labor) when and where it’s needed to efficiently produce high crop yields. 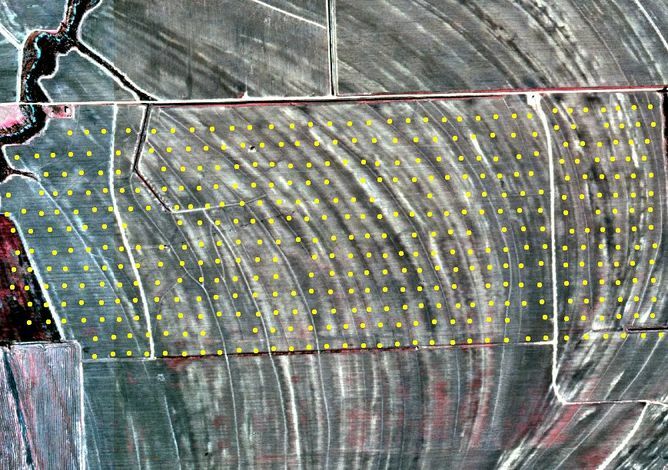 Field positions predefined on remotely sensed image that can be located in the field via GPS for sampling. GPS provides accurate location information at any point on or near the earth’s surface by calculating your distance from at least three orbiting satellites at once. So farming machines with GPS receivers are able to recognize their position within a farm field and adjust operation to maximize productivity or efficiency at that location. Take the example of soil fertility. The farmer uses a GPS receiver to locate preselected field positions to collect soil samples. Then a lab analyzes the samples, and creates a fertility map in a geographic information system. That’s essentially a computer database program adept at dealing with geographic data and mapping. Using the map, a farmer can then prescribe the amount of fertilizer for each field location that was sampled. Variable-rate technology (VRT) fertilizer applicators dispense just exactly the amount required across the field. This process is an example of what’s come to be known as precision agriculture. Precision agriculture requires three things to be successful. It needs site-specific information, which the soil-fertility map satisfies. It requires the ability to understand and make decisions based on that site-specific information. Decision-making is often aided by computer models that mathematically and statistically analyze relationships between variables like soil fertility and the yield of the crop. Finally, the farmer must have the physical tools to apply the management decisions. In the example, the GPS-enabled VRT fertilizer applicator serves this purpose by automatically adjusting its rate as appropriate for each field position. Other examples of precision agriculture involve varying the rate of planting seeds in the field according to soil type and using sensors to identify the presence of weeds, diseases, or insects so that pesticides can be applied only where needed. Site-specific information goes far beyond maps of soil conditions and yield to include even satellite pictures that can indicate crop health across the field. Such remotely sensed images are also commonly collected from aircraft. 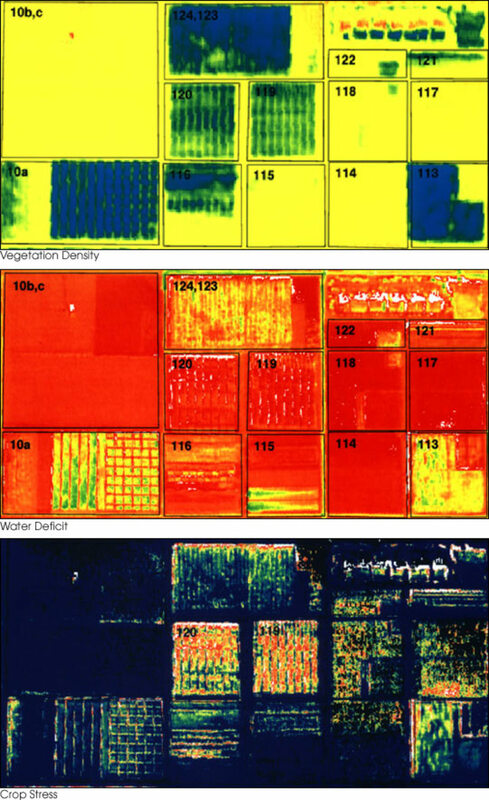 Now unmanned aerial vehicles (UAVs, or drones) can collect highly detailed images of crop and field characteristics. These images, whether analyzed visually or by computer, show differences in the amount of reflected light that can then be related to plant health or soil type, for example. Clear crop-health differences in images – diseased areas appear much darker in this case – have been used to delineate the presence of cotton root rot, a devastating and persistent soilborne fungal disease. Once disease extent is identified in a field, future treatments can be applied only where the disease exists. 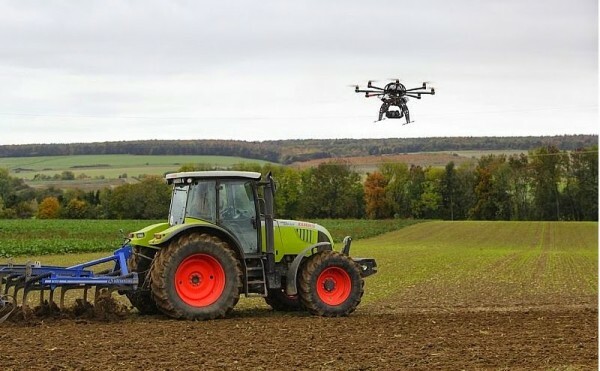 Advantages of UAVs include relatively low cost per flight and high image detail, but the legal framework for their use in agriculture remains under development. Automatic guidance, whereby a GPS-based system steers the tractor in a much more precise pattern than the driver is capable of is a tremendous success story. Safety concerns currently limit completely driverless capability to smaller machines. Fully autonomous or robotic field machines have begun to be employed in small-scale high profit-margin agriculture such as wine grapes, nursery plants and some fruits and vegetables. 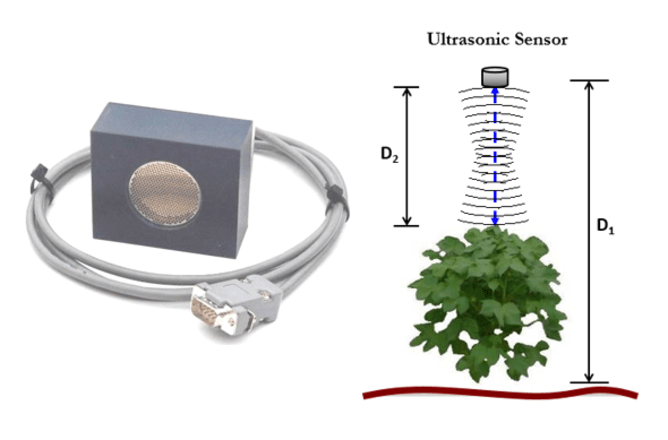 Ultrasonic and other sensors can detect individual-plant conditions at close range. Autonomous machines can replace people performing tedious tasks, such as hand-harvesting vegetables. They use sensor technologies, including machine vision that can detect things like location and size of stalks and leaves to inform their mechanical processes. Japan is a trend leader in this area. Typically, agriculture is performed on smaller fields and plots there, and the country is an innovator in robotics. But autonomous machines are becoming more evident in the US, particularly in California where much of the country’s specialty crops are grown. 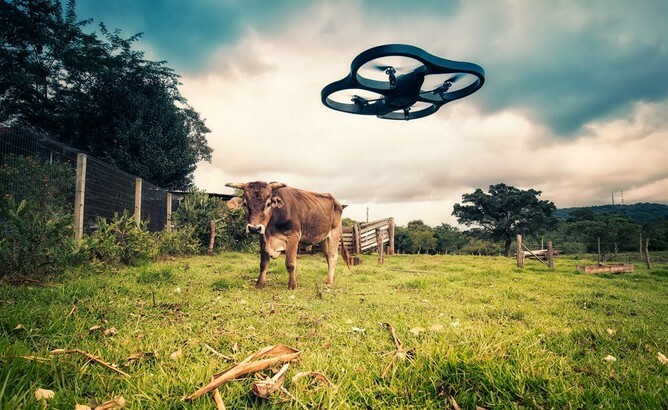 The development of flying robots gives rise to the possibility that most field-crop scouting currently done by humans could be replaced by UAVs with machine vision and hand-like grippers. Many scouting tasks, such as for insect pests, require someone to walk to distant locations in a field, grasp plant leaves on representative plants and turn them over to see the presence or absence of insects. Researchers are developing technologies to enable such flying robots to do this without human involvement. High-throughput plant phenotyping (HTPP) is an up-and-coming precision agriculture technology at the intersection of genetics, sensors and robotics. It is used to develop new varieties or “lines” of a crop to improve characteristics such as nutritive content and drought and pest tolerance. HTPP employs multiple sensors to measure important physical characteristics of plants, such as height; leaf number, size, shape, angle, color, wilting; stalk thickness; number of fruiting positions. These are examples of phenotypic traits, the physical expression of what a plant’s genes code for. Scientists can compare these measurements to already-known genetic markers for a particular plant variety. The sensor combinations can very quickly measure phenotypic traits on thousands of plants on a regular basis, enabling breeders and geneticists to decide which varieties to include or exclude in further testing, tremendously speeding up further research to improve crops. Just another day on the future farm? Agricultural production has come so far in even the past couple decades that it’s hard to imagine what it will look like in a few more. But the pace of high-tech innovations in agriculture is only increasing. Don’t be surprised if, 10 years from now, you drive down a rural highway and see a very small helicopter flying over a field, stopping to descend into the crop, use robotic grippers to manipulate leaves, cameras and machine vision to look for insects, and then rise back above the crop canopy and head toward its next scouting location. All with nary a human being in sight.